In a time of social despair, the release of the “Straight Outta Compton” film continues to act as a pivotal element in re-inspiring multiple generations of people across the world. Although the timely film brought back some unsettled memories for a few people (get the story behind the film here: https://byoungncompany.com/inspiration/), it positively recollects how “the world’s most dangerous group” made Los Angeles professional sports apparel a popular trend within Hip Hop and many other cultures. In the 2010 ESPN 30 for 30 “Straight Outta L.A.,” former NWA member Ice Cube talks about how LA Hip Hop changed the rules of the rap game in the same way the LA Raiders changed the rules of football. During the Raiders’ 13 years in LA, the team was known for being the ruthless “bad boys” of football and NWA identified with that same ruthless, bad boy attitude in rap, which is why group members were frequently seen sporting black or wearing Raider gear. It was all a part of their identity. It’s no surprise that Dr. Dre was able to transform classic library headphones that made their way into music studios into a popular trend of “Beats by Dre,” since he and NWA were able to make professional sports gear in LA a hot commodity over 20 years ago. 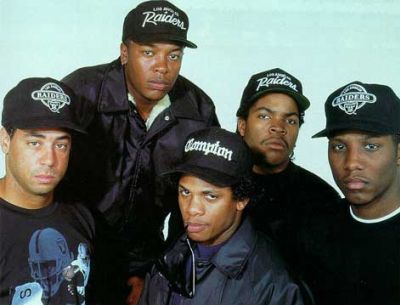 Regardless if the teams were winning or not, NWA made it cool to be a Kings, Dodgers or Raiders fans. Furthermore, even people from different cities and states were proud to wear LA sports teams’ apparel because of the identity NWA created. In the same way Run-D.M.C. made Adidas a popular fad in the 80’s, NWA single-handedly built a brand for the sports arena in LA. It’s too bad that endorsements for Hip Hop and media moguls weren’t as prominent then as they are today, because sports organizations generated a lot of revenue due to the Hip Hop culture. Furthermore, a lot of sports teams and organizations have made money as a result of free promotion from rap artists. But it wasn’t as much about money then as it is now. As Ice Cube stated, wearing home-team sports gear was all about identity and representing where you were from. Sport is one of the few facets of life that has the power to unite all people, no matter their background or culture. Here’s the full “Straight Outta L.A.” documentary directed and narrated by Ice Cube. ← Softball or Female Baseball Players?